There’s a strong emphasis on workplace ethics, and though it is being strongly promoted, there is still some vagueness in the concept. What exactly is ethics? What do we really understand by the term, ‘ethics,’ as a whole? Some people might say it has to do with religion, with good and evil and with moral behavior. In its truest form, however, ethics is a philosophy that defines the dos and don’ts of an individual and a society. It is the requirement for an individual to adopt certain practices, behaviors, and codes of conduct that can benefit him as well as his society. The philosophy of Ethics has been around for thousands of years, but it is only in modern times that it has gained new precedence with the arrival of people and organizations that focus on human rights and creating environments for people to work together happily and peacefully. The 21st-century modern employee is not victim to corporate despotism, slavery or cruel working conditions as were the people of the previous centuries. Today’s working culture is all about the balance of power, the importance of ethics, and the need for creating progressive working cultures. As an organization of the 21st century, you are required to have a strong work ethic in your team. You are required to follow laws of the trade, respect individual rights, prevent discrimination, and safeguard the welfare of your employees. 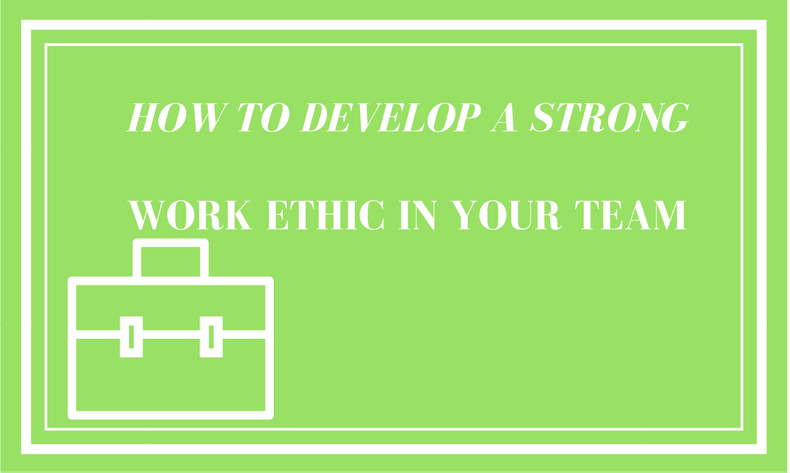 How do you develop a strong work ethic in your team? Here are a few important suggestions. An organization that does not have a code of ethics as a guideline will always find itself in some form of ethical problem or controversy. You may think the lack of ethical guidelines won’t be a problem, but take a look around you - companies that kept ethics at the backbench are now struggling to keep the trust of their customers. From lawsuits to defamation, from dwindling business sales to embarrassing news reports, the list is endless! Guess what? You can avoid all of this if you define and implement ethical guidelines for the organization. To start off, you need to be able to define the scope and the priority given to ethics in your organization. You need to help your team understand the dynamics of ethics and what would constitute as ethical or non-ethical behavior. The one question you may always want to ask yourself and your team is whether you value profit over ethics or vice versa? Most organizations seem to value profit and engage in practices that compromise not only ethics but also legal boundaries. Where do you as an organization, a leader or a director draw the line and why? Ethics is not a set of rules, it’s actually workplace culture. It is the embodiment of your beliefs and the representation of your values. What is your stance on gender balance, your views on nepotism, your stand on harassment and so on. What you accept is what you allow in your organization. Therefore, if you want your organization to stand strong, you first need to identify your own belief system and where you draw the line. Most employees quit their job today simply because of unethical and unfair organizational culture. They feel stifled in an environment that practices favoritism, late-hours, unnecessary work pressures, and keeps goals and tasks above the well-being of its own people. If we look around us, there is a strong cult following of entrepreneurs and businessmen who promote the 60-hour or 80-hour work culture as, “success.” They fail to see the fact that such a lifestyle leads to isolation from friends and family and creates multiple diseases that could easily be prevented. Is this something you would want in your organization? Is it ethical to enforce a 14-hour working culture? Or do you want your organization to have flexible work timings? Do you want your employees to enjoy work-life balance? All of these are questions that seemingly may have no relation to ethics, but in the long run, they become ethical concerns as employees become sick, stressed or fall victim to mental health issues. The best way to incorporate strong work ethics into your team is to have a rulebook or a guidebook ready. The book serves as a reminder of your ethical values and what you expect from your employees. In the long-run, the book also serves as a legal shield if you come across difficult employees or those who would justify any wrong-doing citing the lack of prescribed regulations. You may want the assistance of a lawyer while creating this rulebook to ensure there is nothing amiss. Any loophole in your guidebook can create a huge problem for you later on. Any time you hire a new employee, introduce them to your company’s guidebook and ensure that they are well aware of the rules and regulations in place. They should understand the consequences of breaking rules and of going against the guidebook. For example, you clearly state your stance on plagiarized work and if any of your employees are caught in plagiarism, they will suffer the consequences that can range from demotion to termination. All great companies have a set of organized rules and regulations that employees are trained to follow. Your role as the organization’s head, director or team manager is extremely important. You are the role model of your organization. Your employees look up to you as you lead them to success. This also means that what you practice is what you encourage - so if you’re walking in late, you are sending out a message that you approve late-comings. You cannot use the manager/owner card here to justify that you can come late because you’re the manager while your employees have to be punctual. It’s not fair and is definitely not ethical. Eventually, your organization will suffer because you have not set the example right. So as harsh as this may sound, the responsibility of being ethical falls on to you. Leading by example is way better than leading by a directive or authoritative method. Professionalism at the workplace is extremely important for the healthy growth of the team. Your employees should understand and follow the basic principles of good communication, time management, task management, and behavioral management. They should be trained to handle conflicts professionally without resorting to disrespect for each other. They should be encouraged to give and receive constructive criticism all while bearing goodwill towards each other. Most importantly, they should be encouraged to develop strong work habits that beat procrastination, prevent late nights spent working, and create new opportunities for healthy career growth. At the end of the day, you want a workplace culture where work is done happily and everyone loves their job instead of dreading coming to work the next day. Employees are motivated when they are rewarded not just for their task achievement but also for their attitude and workplace behavior. A reward system ensures that your employees are rewarded for their strength and appreciated for their contribution to the organization. Note that it doesn’t have to be monetary rewards - you could have small celebrations, a cool and funky desk award, or even a customized certificate to appreciate your employee’s adherence to company culture, to ethics, to punctuality, to respect, to professionalism, and to other important values. Sometimes, organizations get quite demanding on what they consider as ethical and employees are implicitly forced to give more than needed. They are shamed into staying late, putting in more hours, doing more work than needed and are constantly expected to be “excellent.” Such attitudes in the workplace are counterproductive and could lead to extreme psychological issues. Many employees fall prey to depression, stress, and other problems. A happy workplace is where people are respected and there is collaboration instead of unhealthy competition. Team members need to be trained to work as a team and not to oust each other out for getting the next career seat. We often see managers and leaders try to convey their point by being sarcastic or by taunts. This is not only dangerous but is completely against ethics and moral values. As a leader, it is imperative for you to have ethics and avoid using taunts or sarcasm to get your word across. When you display such behavior, you’re allowing the growth of gossips, of unhealthy conversations, and of rebellious behavior. It’s not difficult to have an ethical or professional workforce. All it requires is a strong belief system and a wish to create a harmonious workspace for all. Ready to start creating your ethic guidebook?